Steve Wohlberg of White Horse Media just developed a captivating new eBook that deals with Adventist eschatology and current insubordination in the Seventh-day Adventist Church. Steve, thanks for granting us this interview. Tell us about yourself. Were you raised in the Church, or are you a convert? I’m a convert. I grew up Jewish in the Hollywood Hills. As a teenager, I was seduced into the dark world of rock music, drugs, alcohol, and wild parties. It’s a miracle I’m still alive. At age twenty, I read The Desire of Ages, which changed my life. Jesus became my Lord! Within days, God led me to La Sierra College to study for the ministry. When I graduated, I was hired by the Central California Conference as a young pastor, then was sent to our Andrews Seminary. I later pastored churches in Central California, North Dakota, and in the Kansas-Nebraska Conference. In the 1990’s I had the privilege of serving God as an Amazing Facts evangelist. Now I’m happily married to my wife, Kristin, and we have two wonderful children, Seth and Abby. It’s been quite a journey. God has been very good to me. What challenges and victories are you seeing at White Horse Media? White Horse Media has existed as a supportive ministry of the Seventh-day Adventist Church for about ten years. We’ve had some very tough times, but God has blessed our team and kept us afloat financially. As the years have advanced, God has given us a growing influence within Adventism, and beyond. Through radio, television, websites, YouTube, Facebook, Twitter, books, DVDs, CDs, evangelistic seminars in America and overseas, God has used our team to reach many souls for Jesus. White Horse Media is a miracle ministry. To God be the glory! I have read several of your books in the past, and found them inspiring. What is unique about this latest booklet? Most of my books were written to reach the public with Bible truth and to explain the three angels’ messages. What is unique about God’s Remnant Church Divided is that its focus is on what is now transpiring within God’s Remnant Church. As your readers know, our church is facing an unprecedented crisis. For the first time that I’ve ever seen, we are witnessing Conferences, Unions, and Divisions publicly expressing disapproval with our General Conference. The chasm is widening. Many church members are confused by this. These are solemn times. We are told that the future is digital. Is this your first book to be offered in a digital format? No. Many of my books are on Amazon.com as eBooks. But this new one is different. First of all, because my new book deals with such a controversial topic, we’ve had a challenging time finding a publisher. But, because so much is happening inside God’s Remnant Church today, and because I have such a deep conviction that the information in our new book needs to reach Adventists quickly, we have decided to release it as an eBook ourselves. Fortunately, technology makes this possible. We see this as God’s providence. Your new book focuses more on what is happening experientially within the lives of Adventist Church members, instead of what is happening politically and internationally. Was it difficult to make that transition? Actually, the eBook blends both elements. Yes, its primary focus is what is happening among Adventists, but it also highlights the increase of deadly natural disasters, plus increasing news reports discussing Sunday legislation as a solution to earth’s growing moral and environmental woes. I believe the two are related. As division grows within God’s Remnant Church, we also see increasing “signs” in society. Surely God is speaking to us through both developments. We must all wake up to what is looming. God is warning us, and pleading with us to prepare for the final storm. You have been an SDA for quite a while—has our Church ever been this divided before? Not that I’ve ever seen. In the past, I’ve seen plenty of doctrinal conflicts, but I’ve never seen Conferences, Unions, and Divisions challenging the General Conference. We may be heading for an actual split. I hope not. The current crisis is unprecedented. What is causing this division? 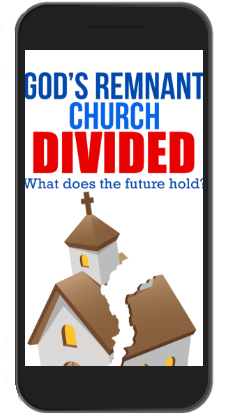 God’s Remnant Church Divided reveals the basic issues. On the surface, the primary issue concerns the ordination of female pastors. This has become the spark to ignite the current crisis. During three General Conference sessions (1990, 1995, 2015), the majority of delegates voted “No” to Adventist women being ordained. Yet many churches, Conferences, Unions, and Divisions feel like they can’t conscientiously abide by those decisions. Then, at our last Annual Council in Battle Creek, the burning issue was whether the delegates should approve the so-called “Compliance Document” that would initiate disciplinary steps upon non-compliant church leaders and organizations. When the votes were counted, that document passed. That’s when many Conferences, Unions and Divisions united like a tidal wave in protest. Especially is this conflict raging in cyberspace. God’s Remnant Church Divided reports on this growing controversy, and includes graphics and educational links. It has been often observed that social justice is quickly taking the place of the Three Angels’ Messages in our Division. What are some of the motivations behind that shift? It seems to me that people like to get behind what they consider good causes. We don’t want our lives to be meaningless, so we humans often feel good about ourselves when we get behind a cause. There is a place for getting behind certain social justice causes. Our SDA pioneers stood against slavery, intemperance, and abortion. But when we read the Bible and Spirit of Prophecy, God has clearly told us that our primary mandate is to spread His three angels’ messages worldwide. One problem today is that many Adventists seem to be making social justice causes their primary mission, and so the three angels have largely dropped out. This is a serious mistake. Many are also championing what they see as social justice causes, but such causes are sometimes contrary to the deep truths of the three angels’ messages, and to God’s plans for humanity as revealed in His Word. Are the struggles in our church a reflection of what is happening in the culture at large? Definitely. I make this very clear in God’s Remnant Church Divided. Society is being racked with gender controversies, and these same controversies are now dividing the Seventh-day Adventist Church. I deeply appreciate the Seventh-day Adventist Message. Is that Message still able to reach people’s hearts in 2019? Definitely. Positively. Powerfully. The Adventist message is God’s message. As White Horse Media reaches out to the public in many ways, we often see first hand the power of God’s Word. “He sent His word and healed them, and delivered them from their destructions” (Psalm 107:20). God’s Word and the power of Jesus Christ changed my life. The three angels’ messages continue to deepen my walk with my Savior. These holy messages come from Jesus. Their focus is His gospel, fearing God, the judgment, the Creator, the Sabbath, Babylon’s fall, the beast, its deadly mark, and keeping the Ten Commandments amidst this sinful generation as we prepare for His soon return. What could be more relevant than that? How is this division affecting our mission? It is a huge distraction taking up much of our time and resources. It is also dividing us, which isn’t good for our witness to the world. Why won’t the women’s ordination issue go away? Because many who support WO feel morally compelled to keep this issue alive. They see it as standing up for Jesus, and for His inclusive, nondiscriminatory character. I think the devil is beneath the shadows too seeking to divide God’s Remnant Church. It’s true that Jesus is inclusive in many ways. When on earth, He ministered to men, women, Jews, Samaritans, Romans, tax collectors, Pharisees, rich and poor. He loves everyone. Today He would reach out to everyone too, including LGBTQ individuals. But Jesus is also exclusive about sin. Read Revelation 21:17. The New Jerusalem has an impenetrable wall around it. At the end, those who have been clinging to sin can’t get in. Does it seem to you that leaders in both positions (pro-Wo and no-WO) are tiptoeing around the core issue—namely “Is it biblical or not?” One side appeals to culture, and the other side appeals to policy. Yes, this is the core issue, but I think many have moved beyond this now. It’s true that in Scripture, God clearly stated that only male descendants of Aaron were to be His priests. But those who firmly favor WO remain unconvinced because they often see the Bible itself as culturally influenced. Thus “the core issue” of “Is it biblical or not?” is fast becoming irrelevant to many. People are lining up behind their positions, and the chasm is widening daily. But now, the issue isn’t just ordination or policy, but God’s authority in His Church. God’s Remnant Church has voted three times on this issue at three General Conference sessions. But still, many refuse to abide by those decisions. It would be nice if having your name on the Church roster was synonymous with having your name inscribed in the Lamb’s Book of Life, but that’s not the case is it? No, it isn’t. Those whose names are in Jesus Christ’s Book are those who have truly repented of their sins, and trusted Him for salvation. They also “follow the Lamb wherever He goes.” Revelation 14:4. God alone is the ultimate Judge of who is saved or lost. I’m glad I don’t have to make those decisions. God is very patient with us, but at some point He will take matters into his own hands. What might that look like? Yes, He surely will. We don’t know all the details, but I expect the current division to deepen until either a split occurs, or until the mark of the beast crisis finally sifts God’s church. Those who remain faithful to Jesus will be led by God through His Word and the SOP, through the Holy Spirit, angels, visions, dreams, and through God’s faithful leaders. It will be an amazing time. It is said that God’s distinctions are under tremendous assault in our culture. What are some of these distinctions and why does the enemy hate them so much? “Male” and “female.” Biblical marriage vs. fornication and adultery. “The seventh day,” not Sunday. These distinctions are rooted in God’s original plan revealed in the Garden of Eden. Satan hates them because they reveal God’s will, character and principles (which he despises), but we should stand up for them, no matter the cost. Jesus endured the cross because of the joy set before him. How can we experience joy in our lives for the task ahead? By renouncing all known sin, by trusting Jesus, and by closely following His word above all else. This will bring true joy and hope for the future. Yes. I can’t tell you how many satanic challenges we’ve encountered to release this eBook. Computer problems, website problems, technology hurdles, relational tests, etcetera. But God has granted victories over them all. Recently I was awake at 5:00 am with a deep conviction that our new eBook is like a positive virus that can now be uploaded electronically into Lucifer’s global empire. Embedded within this virus are the critical truths that will ultimately end The Great Controversy. God Himself has provided the technology so this virus can “go global.” I have a dream that Adventists worldwide will seize the moment, and then as they sit at their computers, they can simply and prayerfully insert this potent link, GodsRemnantChurchDivided.net, into emails, tweets, Facebook posts, and throughout social media. Truly, this can “go viral” among God’s people. Demons may be trembling at the potential results. The three angels’ messages of Revelation 14:6-12 are God’s virus against sin and delusion. From the devil’s perspective, this virus is deadly and incurable. From the Lord’s perspective, it’s wonderfully healing and unstoppable. Soon Satan will vanish forever. Let’s all do our part to help end this war. Pastor Steve Wohlberg is a graduate of La Sierra College (1982) and Andrews Seminary (1985). He was ordained as a Seventh-day Adventist minister in the Dakota Conference (1991), and is now the Speaker/Director of White Horse Media. White Horse Media is a supportive ministry of the Seventh-day Adventist Church and a member of ASI.